​The main trio of East African nations, Kenya, Uganda and Tanzania have a long history of co-operation but also rivalry. This has seen various organisations oversee the joint relationship and historically the sharing of a national airline in East African Airways Corporation. Unfortunately, the failing partnership would lead to the collapse of EAAC and some drastic measures being taken to enable the birth of Kenya Airways from the ashes. From 1967 until 1977 the East African Community (EAC) was the organization that managed inter-territorial co-operation between the three East African countries. Unfortunately, as the 1970s passed the relationship of the EAC members soured due to a range of factors that made the aims of the three nations incompatible. Kenya had the most developed economy and was keen to have a greater say than its neighbours over decision making. At the same time Uganda’s dictator, Idi Amin, was not pleased with Tanzania harbouring forces intent on removing him from power, whilst Tanzania was following a socialist path that clashed with Kenya’s capitalism. One of the results of this was that life was made increasingly difficult for the East African Airways Corporation that by 1975 operated a modern fleet of 4 F27s, 3 DC-9-32s and 4 Super VC10s as well as 5 elderly but effective DC-3s. A quirk of the agreement was that the EAAC fleet was registered in all three countries in a similar manner to the way the SAS fleet is split between Sweden, Denmark and Norway. EAAC was hardly wildly profitable at the best of times but the increasingly hostile relationship between the EAC partners, who had last met in 1969, made its existence tenuous. Aer Lingus had been enlisted to assist the company’s management in 1976 but could do little in the circumstances as both Tanzania and Uganda struggled to, or just plainly refused to, pay their share of EAAC’s funding. In May 1976 Uganda actually founded its own national airline, Uganda Airlines, although services didn’t begin until December. 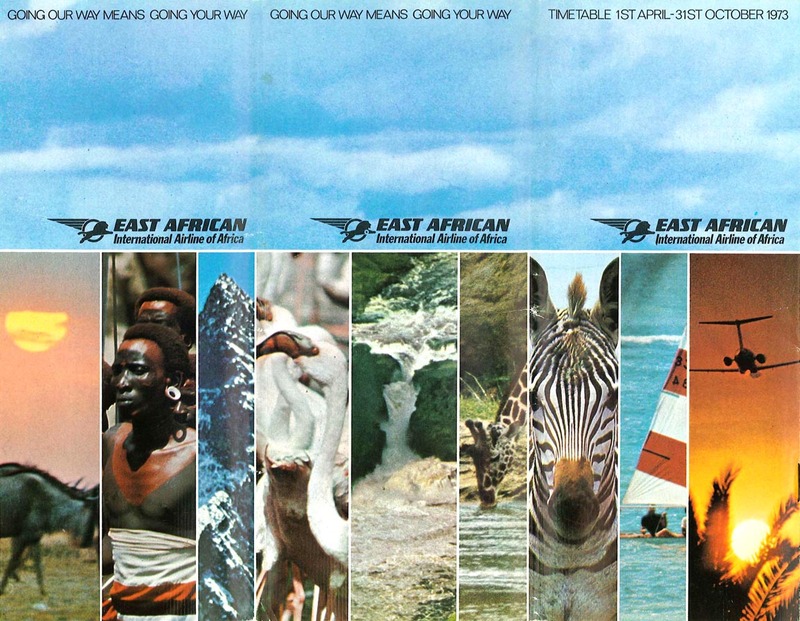 When Kenya refused to keep on financing EAAC in January 1977 it became a race for the partner airlines to acquire EAAC’s assets so that each could start its own airline. Captain John Kiniti was an EAAC DC-9 pilot and one day in January he landed his aircraft at Dar es Salaam, the capital of Tanzania. After his DC-9 was refueled three other EAAC pilots were all refused fuel for their aircraft. Apparently, an order had been given that no fuel was to be provided. Kiniti, like 3,000 or the airline’s 5,000 staff was Kenyan and sensed that something big was up. He was correct. Tanzanian authorities planned on making sure the aircraft did not leave Dar so that they could be used in the new Air Tanzania after EAAC had gone bankrupt. Fortunately, the same day the decision was enacted to impound the aircraft was also the same day as the country’s two biggest football clubs were playing each other. Everybody in Dar es Salaam had their eyes on the football match and the airport bosses had thought that denying fuel would be enough to stop the EAAC aircraft from departing so they didn’t actually order them to be refused departure. ​Captain Kiniti realized what was going on and he asked the unwitting airport staff to transfer fuel from his fully fueled DC-9 to two of the EAAC F27s on the ramp. The last EAAC aircraft, another DC-9, could not be fueled with the available reserves. The airport staff as far as they were aware were following their orders and not providing new fuel. Before the football game was over and the airport bosses had returned all three EAAC aircraft were in the air and heading for Kenyan airspace. Kiniti refused calls from air traffic control, turned off his radio and flew low over the Indian Ocean to avoid being intercepted by Tanzanian fighters. He also warned an incoming VC10 on its way from Mauritius to avoid Dar and head to Nairobi instead. The operations of East Africa Airways were over and it had racked up a huge $120 million debt, which was growing rapidly as soon as Kenya turned off the majority of its funding. Even so $43 million of the debt was owed to the Kenyan government with another $12 million owed to the IATA Clearing House and other large amounts to the British Export Credits Guarantee Department. EAAC was liquidated in February 1977 and the VC10 fleet was repossessed by the British Export Credits Guarantee Department. The rest of the fleet, or at least that in Nairobi, was owned by the Kenyans. The single DC-9-30 and the pair of F27s that had escaped from Dar es Salaam formed the initial fleet of the new Kenya Airways, which began operations on January 22, 1977. The first aircraft to wear the Kenya Airways colours were however a pair of 707s wet-leased from British Midland for the Nairobi-Frankfurt-London route. Ironically the DC-9 that was left behind in Tanzania was Kenyan registered (5Y-ALR). Technically ALR was ‘leased’ to the Tanzanians and formed the initial equipment of the new Air Tanzania. Of the other two DC-9s from the former EAAC fleet both gained Kenyan registrations (one had been Tanzanian 5H-MOI and the other Kenyan 5X-UVY) but the former was sold in September leaving only the latter, now re-registered as 5Y-BBR as the primary medium haul aircraft for regional African services. The DC-9 was sold in August 1989 and joined Midway Airlines as N942ML. Following their bankruptcy, she was taken up by Spirit in June 1992 and served until being withdrawn in May 2003. She was replaced in the Kenya Airways fleet by a pair of leased 737-200s in 1991. ​Unsurprisingly none of the three former EAC nations have found running their own national airlines to be easy and all three have been far from successes. Kenya Airways did not manage to turn a profit of any kind until 1993/94 and to this day the airline continues to be something of a money pit. Nonetheless compared to the defunct Uganda Airlines, and the struggling Air Tanzania, Kenya Airways at least remains a major African flag carrier.